library allows you to export a list to an Excel file. The data in cells can be formatted using predefined formats or user-defined formats. The list must contain the rows, each row being an EasyXLS.Util.List object containing the cell values. EasyXLS.Util.List extends System.Collections.ArrayList for .NET version and java.util.Vector for Java version. The below example shows how to export list to Excel in .NET, Java and export lists of data extracted from database in PHP, ASP, C++, VB6, VBS and Coldfusion. "WHERE O.ProductID = P.ProductID AND O.OrderID = ord.OrderID"
"WHERE  O.ProductID = P.ProductID AND O.OrderID = ord.OrderID"
"Writing file C:\Samples\List to Excel.xls." 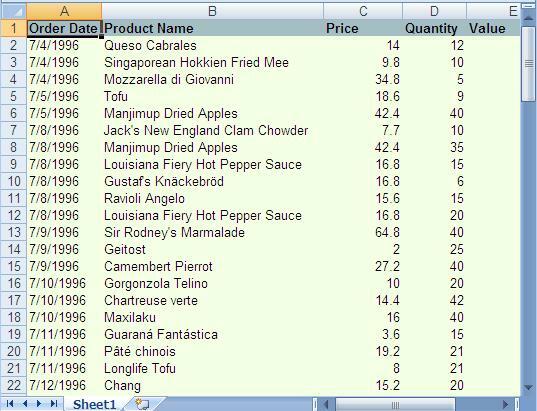 The screen shot below provides an example of an exported Excel file from a list. This code sample shows how to export a list to an XLS file. Similarly, you can export a List to XLSX file using ExcelDocument.easy_WriteXLSXFile_FromList method or export a List to XLSB file using ExcelDocument.easy_WriteXLSBFile_FromList method. For an Excel file having multiple sheets, the List can be inserted using ExcelWorksheet.easy_insertList method and the Excel file must be exported using ExcelDocument.easy_WriteXLSFile method.